Does this story contain any truth? It now was very late. The shepherds had left. Their angel-fueled awe had been overwhelmed as they knelt in the quiet before the Christ child. Joseph and Mary were full of joy and welcome. Yet the keepers of the sheep, ever mindful of the needs of those they cared about sensed the weariness in the holy couple. They had humbly left with holy joy brightening the journey back to the hills above Bethlehem. Now Joseph sought to make Mary and in the Infant Jesus as warm and comfortable as possible in the stable. 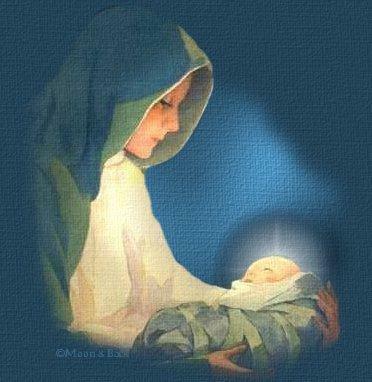 Jesus was fed and wrapped in clean warm swaddling clothes as He rested in His mother’s young arms. But He would not rest. His restless squirms and fussing cries troubled the Virgin Mother. Joseph sought, with his weary love, to comfort and help calm the restless hunger of the infant. But Jesus would not rest. As the long chill night crept on the Infant stayed awake with longing cries and squirming silences. It was in a few moments of tired silence Mary and Joseph heard the steps. In the cold stony ground outside the stable the stealthy steps could not be hidden. Glancing at each other in worry Mary and Joseph said with their eyes that they both had heard the steps of the intruder. Clutching Jesus closer to her breast Mary covered Him with a blanket. Joseph arose and quietly crept to the stable entrance. It was then that the shadowy figure peaked into the darkened stable. An anxious cry broke the nervous silence. Struggling within the cloths and blanket Jesus cried with lonely longing cries. And Mary and Joseph understood. Brightening the small fire Joseph then went to the huddling figure hiding at the entrance. With gentle firmness the person was brought close to the restless Infant. Mary arose and brought Christ to the shaking soul. With a warm smile of she placed the restless Jesus in the dirty arms of the wanderer. And it was as you received Christ He cried in contented joy. He was at rest. You were with Him.